The ban awarded to Hardik Pandya threw the Indian team’s plans into disarray for a while. 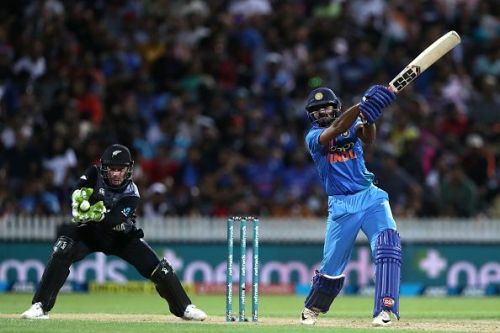 Yet, the way Vijay Shankar stood up in his absence suggested that India does indeed possess another top-quality all-rounder. While his bowling wasn’t tested to the hilt, his batting seemed to have come up by leaps and bounds. The memory Indian fans have of Shankar is him fluffing his lines in the Nidahas Trophy final. However, against New Zealand, he showcased that there is a lot more to his game than what initially met the eye. The right-hander looks a classical batsman capable of batting anywhere across the order. Moreover, his bowling adds another string to his bow. With Kedar Jadhav highly injury-prone, the Indian team might also be flirting with the idea of Shankar at No.6. At the said position, he would provide batting might while he would also be able to turn his arm over if the situation demands. The epitome of a three-dimensional player, Shankar is being given another go to cement his place in the squad. And hence, Karthik found himself out of the fray to allow his state compatriot the ideal stage to display his talents.